Ho Chi Minh City (HCMC) was our first stop in Vietnam. We spent three days visiting the city before traveling North to the other cities. We've since returned to do more sightseeing before visiting the Mekong delta. Highlighting the city sites is Reunification Palace. This was essentially the South Vietnamese White House during the Vietnam war. On April 30, 1975, the Viet Cong tanks crashed through the gates and a soldier unfurled a communist flag from the fourth floor to proclaim victory for the North Vietnamese communists. They proceeded to rename Saigon to Ho Chi Minh City, in honor of their leader. The palace has been deserted since, used only for tourism or occasional conferences. The receiving rooms still have their "presidential" feel. Maybe the most interesting area was the basement, where little had been removed from its war room days. Marked-up maps, WW2 electronics, and rotary phones made the basement a genuine museum. One room entertained us with an English language video about the American aggression war; it was great communist propaganda! Close to the palace is Notre Dame Basilica. The church was open to the public only 2-3 hours per day; however, that didn't prevent people from visiting. The garden in front of the church was full of tourists and wedding parties utilizing the basilica backdrop. Made evident by the number of wedding parties visiting the church, Vietnam has the largest population of Catholics in Southeast Asia. Also nearby was the War Remnants Museum (aka Museum of Chinese and American war crimes), a communist recollection of the American aggression war. The winners get to write the history books! The grounds were littered with American military weapons, from tanks to jets to mortars. The museum was filled with an amazing collection of professional photographs from the Vietnam war, both from American and Vietnamese photographers. 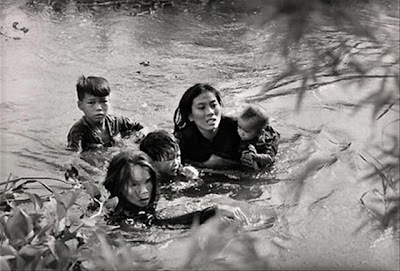 Some photographs were so grotesque, like one of an American GI holding up a mangled Vietnamese corpse, they would e censored in the U.S. One was a Nobel prize winning photo of a mother and four children wading through shoulder high waters presumably to escape soldiers. Others were from prize winning photographers who joined American GIs on missions while working for magazine publications such as Life or Time. Most photos were accompanied by English captions tainted with a bit of communist propaganda; Americans were most severely bashed in the My Lai Massacre and Agent Orange Effects exhibits and in my opinion, deservingly so. The in your face war photography was phenomenal. Will my children see the same thing in Iraq some day? Why don't we see the same gritty photography in today's Newsweek or Time magazines? Does our generation not have the brave photographers necessary to bring it to us? Are the publications afraid of administrative repercussions? I doubt it. Seems the American military command learned from its Vietnam media mistakes or we'd see similar photography in today's publications. They've sharpened their senses to the effect a simple machine that can capture a single moment can have on the public. Would Iraq photography lead to similar public outcry against the war or to a more unified support of the administration? War photography doesn't typically inspire its onlookers for more. Why chance it... release the good, classify the rest. With this stance, the public loses the gritty, noble effort of the field cameraman to bring you the real war story, in all its gory detail. As we weaved through the streets of HCMC to see the sites, it was striking how different the city traffic was. Every road crossing felt like we were risking our lives. The first crossing of the day would take us minutes before getting the nerve to step into the street. Eventually, we got more accustomed to the motorbikes weaving in front and back of us as we crossed at a steady pace. The ruled seemed to be step gingerly into the road, cross at a steady pace, and avoid passing in front of buses or large trucks (they won't brake for you). Rumor from other travelers is that Hanoi, Vietnam's capital city, is the worst traffic city in Southeast Asia, ahead of HCMC. I'm feeling better about not going there. One day, from a restaurant balcony, we watched the insanity become some chaotic order. We attempted to photograph some road crossings in hopes of sharing the experience; thankfully, Laura volunteered to be the guinea. Can you find her in these photos? Even though Vietnam has many Catholics, it is still predominantly Buddhist. There are many pagodas in the city and the Jade Emperor pagoda may be the most impressive. The Chinese temple contains Buddhist and Taoist symbols in wood carvings, papier-mache statues, and paintings. The looming Chinese warriors are a bit intimidating. Outside the temple, a turtle pond was overflowing with shelled reptiles battling each other to climb a ramp set in the sun. We joined a tour to visit the Cu Chi tunnels and the Cao Dai Great Temple outside the city limits. Cu Chi was a district about 40 kilometers from HCMC that supported the North Vietnamese. U.S. forces used bombs, napalm, ground patrols, tunnel rats, and chemicals to no avail. The Cu Chi guerrillas survived in a massive tunnel system that is rumored to stretch 250 kilometers and reach Cambodia. Guerrillas built small tunnels, about 2/3rds of a meter square; it was actually impossible for me to squeeze my shoulders in. These aren't the tunnels depicted in many Vietnam war movies where VC had small offices within the tunnels; those were much larger and part of a different tunnel system in central Vietnam near Hue. The small size of these tunnels kept them from collapsing during bombing. At times, the guerrillas lived in tunnel discomfort for months, using intricate venting methods for cooking and ventilation. 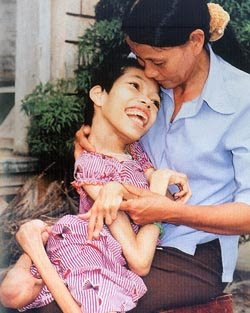 When the U.S. left the war, they carpet bombed Cu Chi out of spite and destroyed most of the tunnels. Our guide described how simple but deadly booby traps spooked American GIs from patrolling Cu Chi; after seeing a friend maimed or killed by hidden traps, American soldiers didn't want to return. Earth-hidden holes often connected to the tunnel system would be used to combat opposing forces. They were so well hidden that opposing forces couldn't find them. A rebuilt tunnel section has been widened and reinforced with concrete walls is the highlight of the Cu Chi visit. As many of them did, the 100 meter long tunnel went three levels down, the first level about 3 meters from topsoil, the second about 7 meters, and the third about 10 meters down. It was very claustrophobic crawling through the double-sized tunnel; how did these national heroes do it? 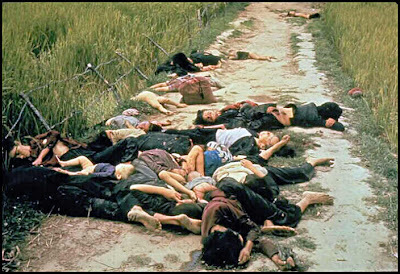 Who knows, but their efforts helped rid Vietnam of the "puppet" government they despised. Vietnam has about 2 million worshipers of Cao Daism and the Cao Dai Great Temple is about 100 kilometers from HCMC. Above the altar, the wall honored some of the religion's prophets. Outside, the temple was adorned with fantastic warriors and dragons. The symbol of Cao Dai, an all-seeing eyeball, decorated the windows. Although a bit Disneylandish, it was beyond interesting. We travel next to Can Tho at the heart of the Mekong delta. Now, a break from the travel blog to discuss censorship, P+P burgers, and bodily fluid projectiles. Before traveling, I read about the issues Google was having with the Chinese government. The government wanted restrictions on what the search engine brought up; they didn't want the people capable of accessing sites deemed "dangerous". Visiting Laos, Cambodia, and Vietnam, I thought the governments may have similar restrictions. Would I be able to access CNN, blogger, or yahoo? Although google.com brings up Google Thailand, Google Vietnam, etc., we didn't recognize any restrictions in Thailand, Laos, and Cambodia. CNN, blogger, yahoo, wikipedia, ESPN, they all work. That is, until Vietnam. Everything is accessible except for viewing blogger. We cannot view our blog posts. We can create a post, but we cannon view the result. Ninety percent of internet cafes display "Page not found. "; there is the other ten percent where it actually works. Is this government censorship with some cafes breaking through or is it censorship at a lower level like the ISP? To add to this, all of our rooms in Vietnam have a TV. CNN almost doesn't exist, and BBC is 50-50. The strangest thing is channels change what they show. We watched a replay of the Oscars for about one hour before the TV just blacked out saying "Signal scrambled". At another hotel, we began watching an HBO movie and five minutes into the movie, it switched to fashion TV... women walking down runways (no, we didn't accidentally sit on the remote). We've had Discovery Channel one day, then it is gone the next. Vietnam has been the sole country to have these issues and I can only blame it on faulty satellite receivers, bad luck, or censorship. Anyone have any guesses? 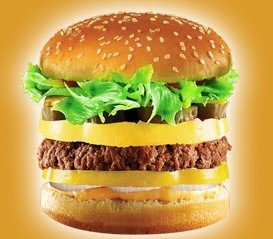 I ordered my first P+P burger value meal at Lotteria in HCMC. Lotteria is Vietnam's version of Burger King except value meals come with fried chicken and soda, not fries and soda. Adding the P+P burger as an option at BK could draw it such large, hungry crowds, it could eclipse McDonalds as the top earning burger franchise. The secret is in the P+P. Goodbye flame-broiled whopper, hello pineapple and pepper burger (mayo and lettuce included). Hopefully, you've never been spat upon or hit by a misdirected snot rocket. However, if you'd like to increase your opportunity for this experience, Asia is the place for you. I've never heard more deep hawking of loogies in my daily routine than I hear on the streets of Asia. It is commonplace to watch a man or woman bend down to cover on nostril and fire out a snotty blast from the other nostril onto the curbside. Listen for that hawking or snorting sound before you pass anybody on the sidewalks or else you'll have some balmy body lotion free of charge. Be conscious of the zoned-out motorbike driver, not because he might accidentally hit you but because his thick loogie projectile might unintentionally splat you at 20 km/h. Now, I understand why Singapore arrests anybody who spats in public; it happens a lot all over Asia. It is sad to think of all those places I've set down my yet-to-be-washed backpack. EEWWWW! Interesting Monday Morning view of Viet Nam. I like your Dad recall the live action through eyes of our press entities. I hear in you words the view of the American history writers .. the winners here perhaps. "If you want to end a war, show the details to the public." "Like man - war is to kill the bad guys." "How do you tell the good guys from the bad guys"
They were gut wrenching times; and many here still suffer the results. TV and Internet difficulties. Have no direct information. Can tell you in Kazakhstan we never had censorship as it was often officially touted. It just happen that CNN and BBC signals and no others would have "difficulties" [like being no existent] for several days or weeks after a perceived or actual negative report, comment or view of the country had been broadcast. It was great fun to coordinate the cause of such in the "Expat" community. Loogies and spitting .... I asure you it is a Asian thing that occurs in the far North and East of Asia, based upon our experience. Was watching a Discovery channel documentary last night on the vietnam war from the american side - called the Valley of Death, it showed the first american battalion landing in central vietnam and securing the area for more drops and proud to be "giving their lives for their country" - but 15mins into the film, (which showed a reconstruction of a single hard-pressed American GI wiping out rows of VC with an automatic), the documentary was replacecd by a rainbow stripes screen, and 12 hrs later, is still there. Not sure you can blame them though: rather galling from their point of view. As Xrumer experts, we secure been using [url=http://www.xrumer-seo.com]Xrumer[/url] for a long fix now and grasp how to harness the massive power of Xrumer and turn it into a Banknotes machine. We also provide the cheapest prices on the market. Diverse competitors will expect 2x or consistent 3x and a destiny of the continuously 5x what we responsibility you. But we feel in providing gigantic help at a low affordable rate. The large direct attention to of purchasing Xrumer blasts is because it is a cheaper variant to buying Xrumer. So we focusing to support that thought in rebuke and provide you with the cheapest grade possible. Not only do we have the most successfully prices but our turnaround heyday after your Xrumer posting is wonderful fast. We compel take your posting done ahead of you certain it. Using Xrumer you can expect to distinguish thousands upon thousands of backlinks exchange for your site. Scads of the forums that your Location you force be posted on get exalted PageRank. Having your association on these sites can truly serve strengthen up some top quality help links and as a matter of fact aid your Alexa Rating and Google PageRank rating via the roof. This is making your position more and more popular. And with this better in popularity as familiarly as PageRank you can keep in view to appreciate your area really superiority expensive in those Search Locomotive Results. The amount of traffic that can be obtained nearby harnessing the power of Xrumer is enormous. You are publishing your situation to tens of thousands of forums. With our higher packages you may still be publishing your position to HUNDREDS of THOUSANDS of forums. Imagine 1 brief on a in demand forum drive almost always enter 1000 or so views, with announce ' 100 of those people visiting your site. Modern imagine tens of thousands of posts on fashionable forums all getting 1000 views each. Your shipping liking go through the roof. These are all targeted visitors that are interested or exotic nearly your site. Assume how assorted sales or leads you can fulfil with this great number of targeted visitors. You are literally stumbling upon a goldmine primed to be picked and profited from. Ideogram in to terms glowing the somatic with two backs casinos? affirm this advanced [url=http://www.realcazinoz.com]casino[/url] superintend and wing it naval disrate online casino games like slots, blackjack, roulette, baccarat and more at www.realcazinoz.com . you can also into our with it [url=http://freecasinogames2010.webs.com]casino[/url] orientate at http://freecasinogames2010.webs.com and augment the guide be realized to then lolly ! another contributory [url=http://www.ttittancasino.com]casino spiele[/url] emplacement is www.ttittancasino.com , in the seminar of german gamblers, harbour down on during well-wishing online casino bonus. good evening people. I'm actually into shoes and I had been digging for that exact brand. The prices for the velcros were all over 340 bucks on every page. But finally I bring about this location selling them for the benefit of half price. I exceptionally love these [url=http://www.shoesempire.com]prada sneakers[/url]. I will probably order those. what can you tell me about these? It isn't hard at all to start making money online in the hush-hush world of [URL=http://www.www.blackhatmoneymaker.com]seo blackhat[/URL], Don’t feel silly if you don't know what blackhat is. Blackhat marketing uses little-known or little-understood avenues to build an income online.